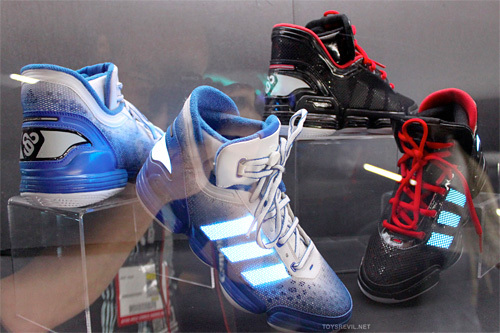 Adidas' TRON: Legacy Sneakers Revealed At Comic Con | OhGizmo! Disney’s upcoming TRON: Legacy sequel is not scheduled to be released for almost 6 months, but it’s already looking like it’s going to give Lucasfilm a run for their money when it comes to marketing tie-ins. These sneakers from Adidas have already been mentioned in previous press releases, but Comic Con seems to be the first time they’ve been shown. Unfortunately as far as I can tell the shoes don’t actually glow (like they should!) but instead include glow-in-the-dark stitching and reflective TRON screenprint graphics so in the right light they look like you’ve just stepped out of Flynn’s arcade. A little disappointing yes, but hopefully there’s a cobbler out there with the electroluminescent skills to make these truly awesome. Does it leave a lazer wall trail in my wake? If not…. well, i might buy them anyway purely for the pretty lights.